Climate change is a global challenge that burdens all of humanity, but not equally. The world’s poor, the majority of whom are women, are encumbered disproportionately. The distinct impacts of climate change on men and women are exacerbated in settings that are also affected by violent conflict, political instability, and economic strife. 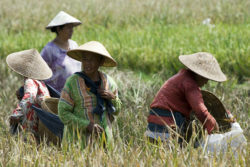 As the world struggles to grapple with rapid onset disasters as well as respond to slower degradation caused by climate change, it is critical to ensure that the plight of women is firmly on the agenda of concerns, and that women – from different backgrounds – are able to lead in negotiations and participate in the design and implementation of programs. This report comes at an important time of international observance when new commitments to action will be made, coinciding not only with the fifteenth anniversaries of UN Security Council Resolution 1325 (UNSCR 1325) and the adoption of the Millennium Development Goals (MDGs) in 2000, but also in anticipation of the Conference of Parties (COP) 21 conference in Paris in late 2015. In an effort to remedy the dearth of existing literature on women and climate change, this report makes an important contribution by covering a wide variety of issues; highlighting both impact and agency; mapping examples of solutions that have proven to be successful; and holding relevance to policy- makers, practitioners, scholars, and students. The findings of the report are based on and buttressed by a thorough examination of international conventions and protocols; national action plans; journal articles and other scholarly publications; reports by government and multilateral agencies; policy briefs and guidance notes, as well as civil society reports. The analysis is also informed by and draws upon a series of consultations with experts from around the world in research, advocacy, program design and implementation, and global leadership positions. As a result, the study represents an interdisciplinary endeavor with far-reaching practical applicability. The report frames climate change as a universal human rights imperative, a global security threat, and a pervasive economic strain. Cataloguing the effects of climate change, the study examines the gen- dered dimensions of sea level rising and flooding; deforestation and ocean acidification; water scarcity; energy production and energy poverty; and climate-related displacement and migration. As part of this analysis, the report not only identifies how women are strained differentially and severely by the effects of climate change, but also how women have, continue to, and could serve as agents of mitigation and adaptation. 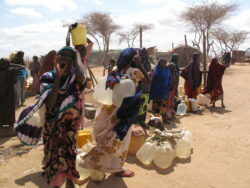 For example, the section on water scarcity details how climate change causes droughts and soil erosion, which not only disenfranchises women farmers, who are the majority of the agricultural workforce in Africa and elsewhere, but also undermines hygiene and sanitation, affecting maternal health, women’s economic productivity, and girls’ education. Similarly, the section on energy identifies the gendered health, economic, and human security consequences of unmet energy needs of families that lack access to affordable and dependable energy sources. It also highlights the solutions that are working, such as the work of Grameen Shakti to provide clean, renewable energy to rural communities in Bangladesh, in doing so building a new cadre of women solar engineers and technicians. The responsibility for addressing climate change falls on multilateral institutions, states, civil society, and the business community. Each of these stakeholders must lead in their respective arenas and work across sectors to forge partnerships and foster collaboration through efforts that are sensitive to the needs and experiences of women, as well as attuned to their capabilities and potential. Greater connectivity is necessary between international, national, and local levels, but, at the same time, it is important to recognize that the mere presence of women does not guarantee that women’s experiences and leadership will be integrated into climate change policies and protocols. While greater inclusion of women at the highest levels of decision-making related to climate change is necessary, it is not sufficient. Women must also be able to lead at the national and municipal levels, just as the perspectives and initiatives of civil society women must be brought into the fore. Attention to lessons-learned and the exchange of ideas are important not only across borders, but also within countries. To this end, the report provides a set of recommendations that seek to enhance the efficacy of climate change policies and programs by introducing gender-sensitive reforms to the current agenda.